Groundwater and stormwater that enters a sewer system is known as inflow and infiltration. Collection systems can be damaged when they are forced to transport more flow than they are designed to handle. Increased effluent also raises operating costs for wastewater treatment facilities, because benign stormwater and groundwater mixes with sewage. In many cases, inflow and infiltration (I&I) accounts for up to 45% of the annual flow to treatment plants. Exceeding the capacity of the collection system can result in discharge of untreated wastewater into the environment either from the collection system components or through a treatment that doesn’t have the capacity to treat the water. Infiltration can also cause pipe structure failures due to erosion of soil support, and ground subsidence due to erosion of underground soil. What is the difference between inflow and infiltration? Infiltration occurs when groundwater seeps into sewer pipes through cracks, leaky pipe joints and/or deteriorated manholes. Inflow is stormwater that enters the sewer system through rain leaders, basement sump pumps or foundation drains illegally connected to the sewer. Together, inflow and infiltration place an additional burden on collection systems and wastewater treatment facilities. The EPA’s Project Certification Standards consider infiltration excessive if the average dry weather flow (DWF) is more than 120 gallons per capita per day (gpcd). This quantity includes domestic wastewater flow, infiltration and nominal industrial and commercial flows. Likewise, excessive inflow–stormwater that enters the sewer system through rain leaders, basement sump pumps or foundation drains illegally connected to the sewer–has been measured according to a variety of standards. The EPA’s benchmark is 275 gallons per capita per day, a number established based on the average wet weather flow in more than 45 different sewer systems. Yet it also takes into consideration the feasibility and cost-effectiveness of eliminating sources of inflow. Regardless of the numbers, if a plant experiences hydraulic overflows during storm events, the inflow is excessive. As with infiltration, Massachusetts’s definition of excessive inflow revolves in part around the financial impact of the situation and includes “all public and private inflow sources, unless existing conditions render such removal technically infeasible or cost-prohibitive.” Essentially, all inflow is excessive, unless it’s too pricey to remove it. Your region may rely on entirely different standards, so staying up to date on the most recent regulations is the only way to avoid fines or government interventions. How to calculate inflow and infiltration? Flow monitoring is the practice of measuring wastewater flow in the system over time and comparing it with a baseline flow estimate to determine the amount of I&I in the sewer system. Flow monitoring can be used as a tool in condition assessment to identify and prioritize areas for further inspection using visual inspection methods to determine the severity of I&I identified. More information on calculating inflow and infiltration can be found in Working Smarter Against I/I. The FELL-41 is another method some use to calculate I&I. It involves surcharging a section of pipe with water delivered through a high-pressure jet nozzle, followed by the introduction of electrical current to determine if there are potential leakage paths through the pipe’s wall. The method produces two data points: the amount of electrical leakage measured (a proxy for water leakage) and the distance within the pipe of the leakage. However, this method may generate unreliable data, as discussed in this white paper. It’s tempting to manage by numbers—to track a single metric, like estimated infiltration rate—in hopes of gaining comprehensive insight about sewer condition. But making smart decisions about sewer maintenance takes a more sophisticated approach. Both a quantitative approach (such as FELL-41 and flow monitoring) and qualitative approach (visual inspection methods) are important to best combat infiltration. To learn more, read the white paper: Quantitative vs Qualitative: The case for a multidimensional approach to sewer condition assessment. Once target areas have been identified through flow monitoring, municipalities should further inspect I&I culprits and use this information to create a plan to combat them. 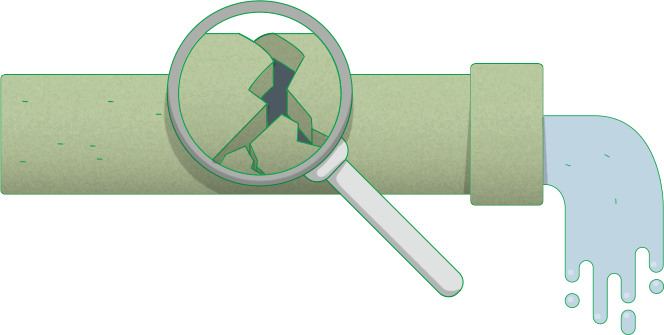 A comprehensive approach to locating defects involves inspecting all aspects of a collection system, including manholes, sewer mains and laterals. Manholes generate a disproportionate amount of inflow and infiltration and play a unique role in the structural integrity of roadways. Field inspectors should evaluate the manhole lid, frame condition and the frame connection for any defects or leak sources. After manually inspecting the manhole cover, the field inspector can employ a manhole inspection camera or a zoom survey camera (also called pole camera) to inspect within the manhole. A manhole inspection camera captures visual and dimensional data and presents the operator with deliverables such as a flat scan with detailed image data covering every inch of the manhole wall, a dense point cloud for 3D visualization of the manhole structure and a virtual view inside the manhole. A zoom camera uses a video camera mounted on a telescopic pole, making inspection inside the manhole possible. During inspection the operator should document all cracks and deficiencies found and decide whether findings are a source of I&I. Learn more about tackling I&I through manhole inspections, here. 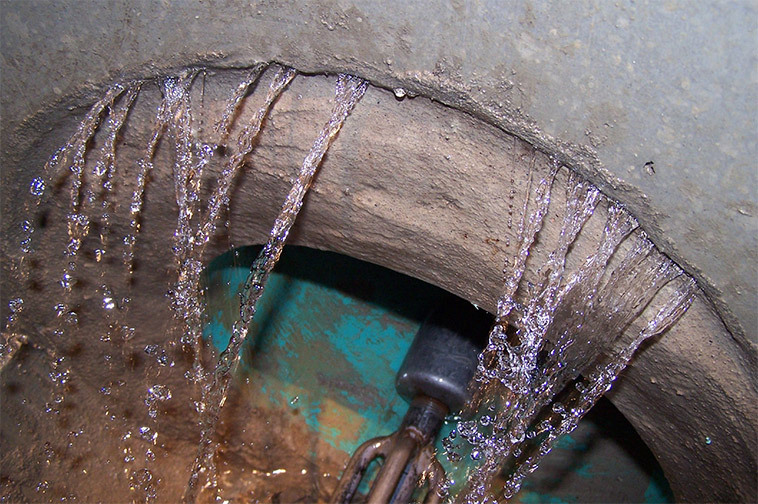 Groundwater seeps into sewer pipes through cracks, leaky pipe joints and deteriorated pipes. A CCTV inspection is by-far the most detailed method of pinpointing and characterizing I&I in pipelines. Sewer inspection crawlers employ a video camera mounted on a remote-controlled, self-propelled robotic crawler that is connected to a video monitor. An operator watching the footage can stop to study any observed defect. The video can identify cracks, fractures or breaks, root intrusions, leaking water (usually infiltration from groundwater), and general deterioration. CCTV inspection can determine the specific location and cause of infiltration. Furthermore, CCTV inspection can be very economical when compared to other I&I inspection methods because it is accurate in pinpointing infiltration sources without requiring other inspection methods. Solely inspecting and rehabilitating sewer mains is not enough when addressing I&I. 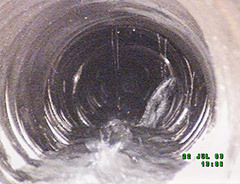 Residential and service laterals are often culprits of heavy I&I, particularly where a lateral connects to the sewer main. Careful inspection of private laterals can help identify sources of I&I. One study reports that when service laterals are renewed following sewer lining, an additional reduction of 20-25 percent of I&I is expected. Lateral inspection can be accomplished from within a residence using a push camera, or from the sewer main using a lateral launch crawler, that travels down a mainline and then launches a secondary camera into laterals. 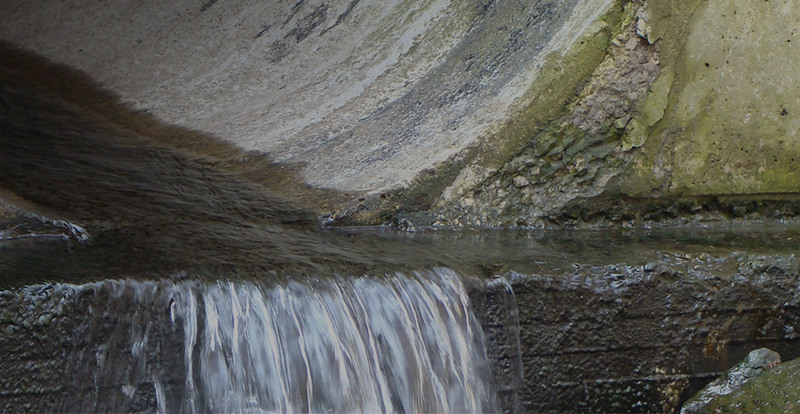 If the number, size and type of defects observed by video inspection do not appear to justify the amount of I&I identified in the flow monitoring, then further investigation work may be needed to identify undetected defects. Sewer Scanning Evaluation Technology (SSET) is an alternative technology to CCTV that removes the responsibility of rating the structural integrity of the sewer from the camera operator and gives it to the engineer. The 360-degree visual scan enables the entire surface of the pipe to be observed in flat view, giving the engineer the capability to measure the opening of joints and cracks as well as pinpoint telltale staining and deposits. Electrical leak location identifies pipe defects by measuring the electrical resistance of the pipe wall. Most sewer pipes are electrical insulators and will have high resistance to electrical currents. A defect in the pipe that leaks water will also leak electrical current, whether or not water infiltration is visually apparent at the time of the test. Acoustic, or sonar, detection is increasingly being used to find leaks. Acoustic sensors use measuring devices to detect vibrations and sound waves emitted by defects and leaks (Feeney). Acoustic sensors can be stopped during the inspection and pulled back and forth to re-inspect a section of pipe or confirm a reading. This process provides utilities with real-time verification of potential problems. More information on locating and detecting inflow and infiltration can be found in Working Smarter Against I/I. A flexible felt liner impregnated with resin is inserted into the line, generally through inversion. Hot water, steam, UV light or ambient temperature is used to cure the resin. 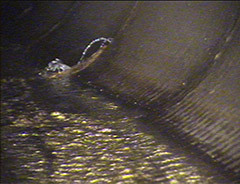 A tapered expansion head is pulled through the line, pushing the pipe wall outward until it shatters. The broken pieces are pressed into the surrounding soil and a new pipe is pulled in behind the head. Static heads are preferred because they are less likely to shift the surrounding soil. When more force is required due to pipe and soil material, dynamic heads can be used. A new liner pipe (one with an exterior diameter smaller than the interior of the existing line) is pulled in from an installation trench. The space between the old pipe and new liner pipe is filled with grout to prevent leaks and, depending on the type of grout, provide structural support. A flexible pipe is deformed, often by folding, and inserted into the host pipe. Then it’s heated using hot water or steam to reform and fit it to the host pipe. An epoxy compound is spray-blown to form a layer on the walls of a cleaned pipe. Continuous airflow keeps the epoxy in place until it cures completely. Pipe reaming is similar to pipe bursting: A tapered drill head is pulled through a line, breaking the existing pipe into pieces. Instead of being pushed into the surrounding soil, however, the broken pieces are suspended in fluid and pushed ahead of the drill head into a recovery pit or manhole. A new line is pulled into place behind the head. Many municipalities rely solely on end-to-end (manhole-to-manhole) rehabilitation techniques like CIPP, pipe bursting and slip-lining to repair failing lines. While end-to-end methods can repair common defects in sewer pipe, in certain situations they can be overkill and a waste of time and money. That’s where spot (or point) repairs are more useful. Because of their targeted nature, spot repairs are able to address localized defects less expensively, faster, and often with less disruption than end-to-end methods. When a single line has multiple defects, however, the decision between spot and end-to-end methods requires careful consideration. Learn more about deciding between spot (point) repair and end-to-end repair, here. A stainless-steel sleeve with a rubber seal is inserted into a line on a balloon packer. The packer expands the sleeve, compressing the rubber against the wall to seal out inflow and infiltration. The stainless-steel sleeve locks in place to provide structural support. Pressure-injecting resin or chemical grout into cracks, holes, joints and the annular gaps of lateral connections helps solve infiltration issues. Resin (polyurethane or silicate) can also structurally stabilize lines by filling voids in the surrounding bedding. Most commonly, injection is performed by a packer that is pulled into location and inflated, sealing off the defect. Resin or grout is then pressure-injected to fill gaps in the pipe and any voids behind those gaps. Chemical grout can also be sprayed into place or injected by hand. Cement grout can be applied in many ways, either through injection (as with other injection methods), robotically, or manually by a worker. Cement can also be spincast, where a uniform layer is deposited on the pipe wall as a spray head is pulled from one end of the pipe to the other. A carrier is pulled into place and expanded, pressing the deformed section of pipe outwards to make it round again. A stainless-steel clip attached to the carrier is pressed outwards, as well, to maintain the correct shape of the line. 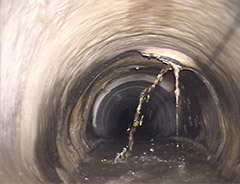 More information on these techniques can be found in the training guide: Sewer Maintenance 101: The Quick and Dirty Guide to Sewer Inspection and Upkeep. What are the financial implications of excessive I&I? The financial impact of inflow and infiltration involves treating the extraneous flow and penalties set forth by consent decrees as a result of SSOs. A recent study of all municipal sewer systems in Tennessee conducted by George Kurz (I/I Survey) shows that inflow and infiltration represents approximately 104,720 million gallons per year. This accounts for 45% of the annual flow to treatment plants. Processing this extra water is estimated to cost at least $188 million annually statewide. This figure is conservative compared to the EPA’s 2014 O&M rate of $2 to $5 per thousand gallons−yielding a cost estimate between $208 million to 522 million. The Clean Water Act (CWA) establishes the basic structure for regulating discharges into U.S. waterways and setting wastewater standards for the industry. In 2012, the City of Memphis, Tennessee was cited for violations against the CWA. The EPA entered into a consent decree with Memphis requiring them to pay a total of $1,290,000 in civil penalties to resolve the CWA violations (EPA). The cost of consent decree penalties can surpass the cost of establishing a comprehensive inspection program. In some cases, the EPA can waive these fines if municipalities demonstrate they have a strategy in place to address I&I. In either case, failure to address I&I can have catastrophic environmental and financial consequences. Learn more in this article: The financial impact of I&I. What is I&I’s impact on water treatment capacity? Learn more in the article, What is I&I’s impact on water treatment capacity? Read about the City of Hillsboro, OR and their program to combat infiltration in this Customer Spotlight. Franklin Township Sewer Authority in New Jersey has a preventative maintenance program they’ve used to successfully tackle infiltration. Elements of their preventative maintenance program include ongoing sewer flushing, inspections and rehabilitation. These efforts have resulted in a significant reduction in inflow and infiltration throughout their collection system. Learn more here. Sewer Maintenance 101: The Quick and Dirty Guide to Sewer Inspection and Upkeep. Tackle Inflow and Infiltration (I/I) with Manhole Inspection. The Financial Impact of I/I. Inflow and Infiltration's (I/I) Impact on Treatment Capacity.